Fr Andreas Hönisch, founder and superior general of the Servi Jesu et Mariae, died this night at the age of 77. Fr Hönisch was born on 3 October 1930 in Habelschwerdt, Silesia (today Poland). After having attended a Jesuit grammar school, he entered the Society of Jesus in 1952. Having originally been destind for mission in Asia, from 1958 to 1960, he was, as a scholastic, in Japan under the then provincial, Fr Pedro Arrupe SJ. Having returned to Germany for health reasons, in 1963 he was ordained a priest by the bishop of Berlin, Cardinal Bengsch. Having finished his tertianship in Paray-le-Monial, he was first appointed chaplain at a Berlin grammar school, then parochial vicar of a parish in Gießen, Hesse. While at this post, in 1976, he founded the KPE - Catholic Scouts of Europe, to counter the disaster that was happening to Catholic youth ministry at the time. His solidly Catholic teaching and youth work brought him into conflict with his superiors, which led to his expulsion from the Society of Jesus. He, who was also a gifted musician, organ player and choir director, later said that following his expulsion, for one year he was unable to sing. He was incardinated as diocesan priest into the diocese of Augsburg, Bavaria. With the consent of the bishop of Augsburg, Msgr. Stimpfle, in 1988 he founded the new order of the Servi Jesu et Mariae (SJM, Servants of Jesus and Mary), a new foundation to carry on the work of the traditional Jesuits in the spirit of St. Ignatius of Loyola, whose first members came from the scout movement founded by Fr Hönisch. 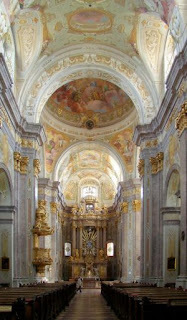 The traditional outlook of the new congregation, which at the same time had as its goal a contribution toward liturgical renewal in the sense of the continuing tradition of the Church, manifested itself also in the fact that the SJM priests celebrate both the TLM and a novus ordo in the spirit of tradition (ad orientem etc.). The SJM were recognised as a Congregation of Papal Right in 1994 under PCED. Members of the order, which numbers about 50, are working in parishes in Germany, Austria, Kazakhstan, Albania, Roumania, Ukraine and in France. Besides the care of souls in parishes, they offer retreats (Ignatian exercises), religious training groups and catechism. They are specially concerned with children and youth work. The congregation has a boarding school in northern Germany and is engaged in the group work of the Catholic Scout Movement of Europe. Individual members are engaged in the protection of unborn life and work in the press apostolate and in philosophical and theological teaching activities. Fr Hönisch was superior general of the SJM until his death. May the Lord grant eternal rest unto him. 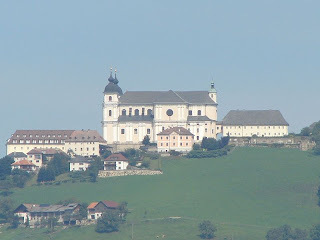 However, there is not only sad news from the SJM, but also glad news: On 22 February, 3 deacons of the congregation will be ordained priests in the basilica of the Most Holy Trinity on the Sonntagberg in Lower Austria (pictures below). The sacrament will be conferred by H.E. Msgr. Athanasius Schneider, auxiliary bishop of Karaganda, Kazakhstan, who recently made a strong case against communion in the hand in the Osservatore Romano and has written an entire book about the question of communion recieved kneeling and on the tongue with a foreword of Msgr. Ranjith, Secretary to the CDW, as posted above. The requiem for Fr Hönisch will be held Friday, 1 February, at 11 a.m. in the same basilica of the Most Holy Trinity on the Sonntagberg. It will be in the extraordinary form of the Roman rite. The celebrant will be Prelate Camille Perl, Secretary of the Pontifical Commission Ecclesia Dei. The funeral will be on the same day at 2 p.m. in Blindenmarkt, where the mother house of the Congregation is. See press relase and SJM site (both in German).